Open daily 10:00 am to 10:00 pm, last skate 9:00 pm. Skate sessions are 45 minutes starting on the hour. For example 11:00 am starts and ends 11:45 am. We open daily 10:00 am to 10:00 pm with the last skate session starting at 9:00 pm. The only day we are closed is Christmas Day. Please arrive 30 minutes ahead of your session. We will be closing on Christmas Eve at 10.00 pm. Should you require private skating tuition, please contact us. If you wish to ice skate with a carer, please advise in advance so we can make sure all the arrangements are in place. Tickets are available online and at the onsite Box Office which is open from 9:30 am – 9 pm. We recommend that you buy your tickets in advance to avoid disappointment! Skate hire is also included in the ticket price but please note socks must be worn by anyone who wishes to skate. Lockers are available to hire for £1 in the skate hire hall to keep your personal belongings safe whilst you skate. So what are you waiting for? Book your slot today here or call 0121 663 1090. Exclusive prices are subject to change. Under 7’s must be accompanied by an adult. We offer group discounts available for bookings of 10 or more priced at £7.00 per person, which must be purchased as one transaction. We ask that groups containing children under 7 ensure our 1:3 ratio (1 adult to every 3 children) is adhered to. For group specific enquiries please contact our dedicated Groups service hotline on 0121 663 1090. 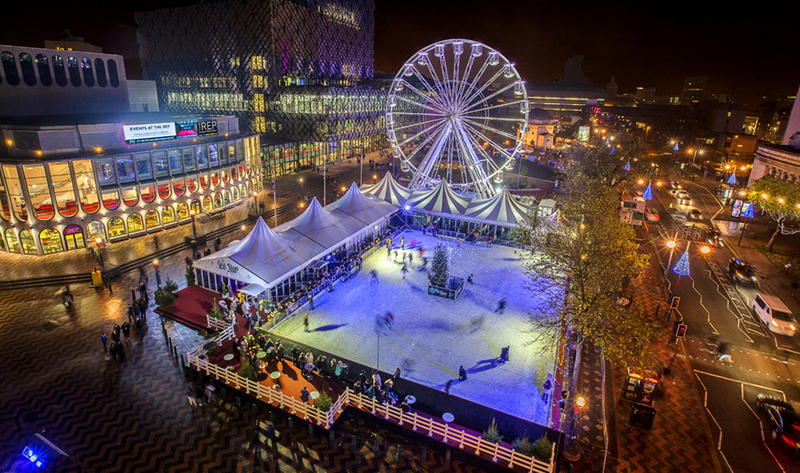 Ice Skate Birmingham is a fun and unique festive alternative for birthday parties, Christmas office get together’s, social group outings and more. Please speak to the Ice Skate team about your special occasion. Please contact us on 0121 663 1090. Ice Skate Birmingham welcomes school groups and families with children of all ages. 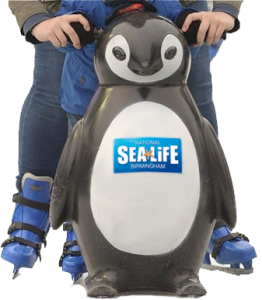 We have penguin skating aids to hold while skating – perfect for little beginners! Skate sizes go from 8J to 15. To avoid over crowded ice rink we would recommend the early morning sessions. Penguin skating aids are for hire in the skate hire hall for £3 purchased from the box office or with your online booking in advance. There is a discount available for students and senior citizens priced at £7.50 on the door. Please note- A relevant concession card or a valid student ID such as an NUS card is required for the discount. 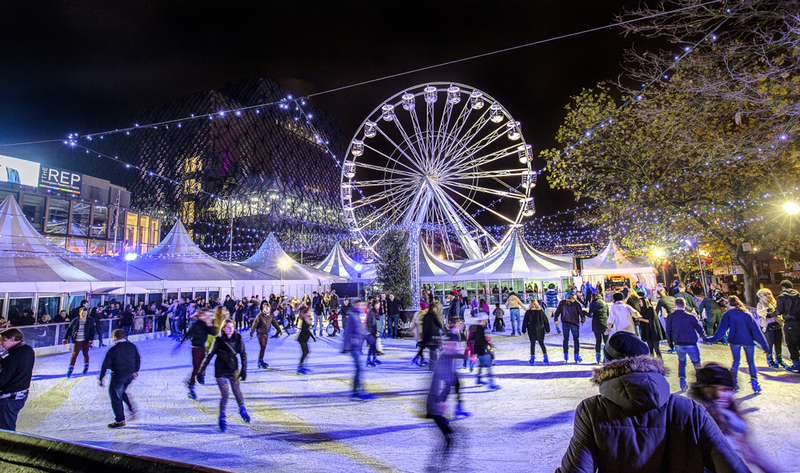 Ice Skate Birmingham is fully equipped for everyone to enjoy. If you wish to ice skate with a carer, please advise in advance so we can make sure all arrangements are in place. Hand operated wheel chairs can be used on the ice granted you are accompanied by an adult to push for safety reasons. We recommend you wear warm, comfortable and waterproof clothing. The ice is wet so it is important you dress appropriately to ensure you have the most enjoyable time. We suggest Waterproof Clothing, Socks, gloves and hats. PLEASE NOTE SOCKS SHOULD BE WORN BY ANYONE WHO WISHES TO SKATE.